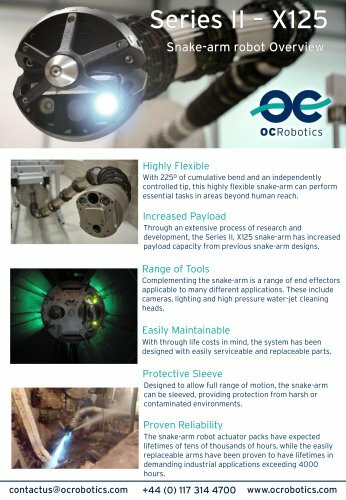 OCRobotics Highly Flexible With 225° of cumulative bend and an independently controlled tip, this highly flexible snake-arm can perform essential tasks in areas beyond human reach. Increased Payload Through an extensive process of research and development, the Series II, X125 snake-arm has increased payload capacity from previous snake-arm designs. Range of Tools Complementing the snake-arm is a range of end effectors applicable to many different applications. These include cameras, lighting and high pressure water-jet cleaning heads. Easily Maintainable With through life costs in mind, the system has been designed with easily serviceable and replaceable parts. Designed to allow full range of motion, the snake-arm can be sleeved, providing protection from harsh or contaminated environments. Proven Reliability The snake-arm robot actuator packs have expected lifetimes of tens of thousands of hours, while the easily replaceable arms have been proven to have lifetimes in demanding industrial applications exceeding 4000 hours.